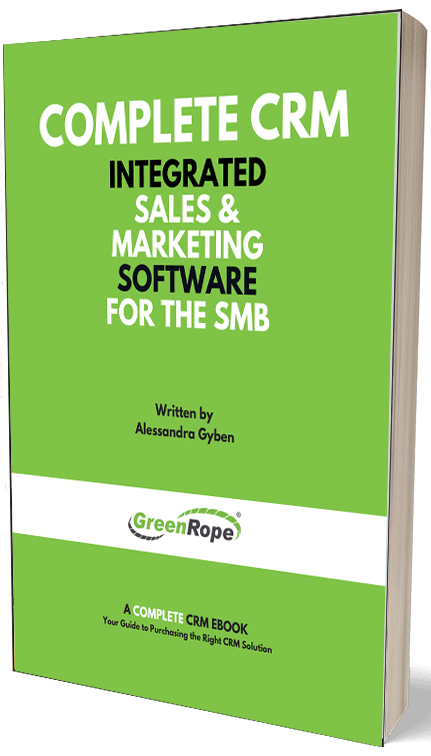 Blog and News | GreenRope :: Is CRM Enough? Customer Relationship Management (CRM) is no longer a new and trendy term, it is a foundational piece of any business. CRM has now been around for years. At its core, CRM is used to house, track, and manage prospects and customers. But, we still beg the question, is CRM really enough when it comes to the selling process? Most buyers are much more savvy than they used to be when deciding to buy a product or service. They do most of their research prior to reaching out to a sales person. At the point when they do speak with someone, they are looking more for a helpful point of contact that offers good customer experience and support. More likely than not, prospects have already interacted with your brand at many different touch points including website visits, downloading ebooks, attending webinars, and visiting your blog before speaking with sales. But, imagine the potential insight and data you are missing if you don’t have a software that tracks those behaviors? CRM is limited in its ability to track and analyze buyer behavior, so it makes it hard to determine where a lead is in the buying process without actually talking to the person. This is where marketing automation slides right on in, and becomes an integral part of the puzzle. Marketing Automation platforms are designed to help marketers design, execute and track lead generation, lead nurturing, and customer retention efforts. But, that is not all they are used for. Marketing automation platforms, and, in particular, integrated systems containing both CRM and marketing automation tools, are beneficial for sales and marketing teams alike. Why? Sales people can use valuable data from their organization’s marketing efforts to gain a better understanding of who their customers are, what they want, and how they can help solve their issues. However, this takes both CRM and marketing automation intertwined into one sales and marketing platform. Both CRM and marketing automation are needed if you want to be successful and compete in today’s business environment. Obtain valuable insight into what your customer’s are interested in and develop better ways to provide them with the content and information they need. This insight comes from clicks, webinars attended, ebooks downloaded, interactions and much more. Nurture your leads through a cocktail of valuable content, follow up, and more. CRM and marketing automation work together to educate and guide leads down your sales funnel before they even speak with a sales person. CRM and automation work together as automation lets you automate your efforts and CRM lets you track and manage your leads and customers’ behaviors. Once a lead becomes ‘sales-ready’ after going through your lead nurturing program, a sales person is well-equipped and armed to successfully close the deal. Why? Because a CRM tracks all interactions, they know every step in that customer’s journey and can tailor their sales pitch to meet the needs of their leads. So, you see, CRM just isn’t enough anymore. Maybe if the internet didn’t exist, and consumers were not as savvy as they are, CRM would be sufficient. However, we live in a digital age, and integrated CRM and marketing automation platforms combine the necessary elements for any business to successfully learn more about their buyers, their journey, and what factors go into securing the deal.